Recent storms have seen a record number of deadly man o' war washing up along the Cornish and Welsh coastline. 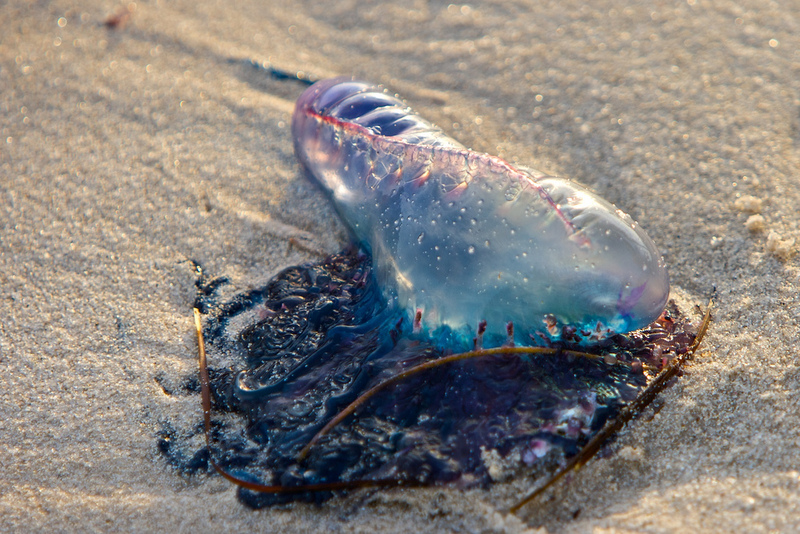 Large numbers of Portuguese man o’ war jellyfish have been washing up along the coastline of Cornwall and Wales after a series of heavy storms. Earlier this morning Perranporth beach was red flagged after a smack (yep, that’s the collective noun) of potentially lethal man o’ war were spotted in the sea. The news comes as 144 beachgoers, from Newquay to Newgale have reported seeing the large distinctive creatures washed up on the beaches. Sightings have also been recorded at Porthmellon Beach on the Isles of Scilly and Cornish beaches of Summerleaze, Widemouth, Perranporth, Hayle, Holywell Bay and Praa Sands. The man o’ war sport long blue tentacles which can grow up to 10m in length and can “deliver an agonising and potentially lethal sting” according to Dr Peter Richardson from the Marine Conservation Society. “They are very pretty and look like partially deflated balloons with ribbons but picking one up could be very nasty,” he added. They also can also retain their sting when washed up, even if they look dead and anyone who has been stung should get the tentacles away from them as quickly as possible. According to the NHS if you do get stung you should use tweezers or a clean stick to remove the man o’ war tentacles from you. If they’ve stung you somewhere sensitive or the symptoms become severe it is recommended you seek medical help. “This is an unprecedented event and we urge the public to be cautious and to keep an eye out for unusual species being stranded.” said Matt Slater, Marine Awareness Officer for Cornwall Wildlife Trust.